The Only Truly Communicative Vocabulary Development Program! Welcome to the exciting new edition of the picture dictionary program famous worldwide for its ease-of-use, lively spirit, and active conversational approach. * Vibrant illustrations and simple accessible lesson pages are designed for clarity and ease-of-use with learners at all levels. Word by Word is the most learner-friendly picture dictionary — especially for Beginners. * More than 4,000 words in an expanded range of topics prepare students for success using English in everyday life, in the community, in school, and at work. * A careful research-based sequence of lessons integrates students' development of grammar and vocabulary skills through topics that begin with the immediate world of the student and progress to the world at large. * New lesson formats provide integrated context-based instruction with nouns and high-frequency verbs. Objects and actions that go together are learned together! * Expanded discussion questions encourage students to share their backgrounds, experiences, opinions, and creativity as they relate vocabulary and themes to their own lives. * A new Teacher 's Guide and Lesson Planner with CD-ROM in a colorful user-friendly format includes lesson planning suggestions, community tasks, WordLinks for expanding vocabulary themes through the Internet, and reproducible masters to save teachers hours of lesson preparation time. Vocabulary Workbooks feature motivating vocabulary, grammar, and listening practice. Standards-Based Lifeskills Workbooks provide competency-based activities and reading tied to national, state, and local curriculum frameworks. 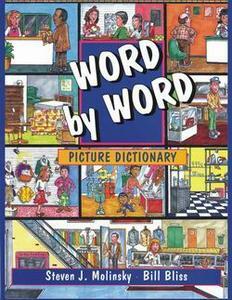 A Literacy Workbook is also available. The outstanding audio program includes all words and conversations for interactive practice, and — as bonus material — an expanded program of WordSongs for entertaining musical practice with the vocabulary.